According to the African Union (AU), the proliferation of weapons of mass destruction and their delivery systems remains one of the greatest threats to international peace and security. This was reaffirmed during the recent preparatory committee (PrepCom) meeting for the 2015 Review Conference of the Parties to the Treaty on the Non-Proliferation of Nuclear Weapons (NPT), held from 30 April to 11 May 2012 in Vienna. At the meeting the AU also reaffirmed Africa’s continued commitment to realising the goals and objectives of the NPT; to a world without nuclear weapons in which nuclear science and technology is [only] harnessed for the development of humankind. However, tensions around Iran’s nuclear programme and the stance of North Korea still complicate the debate between the nuclear weapon states and the non-nuclear weapon states regarding the relative importance of the three pillars of the NPT, namely disarmament, non-proliferation and the right to utilise nuclear material for peaceful purposes. Most non-nuclear weapon states noted at the meeting that the failure to reduce the role of nuclear weapons in security doctrines, lack of progress on the operational status of warheads, on-going modernisation of nuclear arsenals, and the continued placement of nuclear weapons outside nuclear weapon states’ territories meant that disarmament obligations were not fulfilled. Importantly, this meeting in Vienna also focused on the catastrophic humani­tarian consequences of any use of nuclear weapons and the relevance of international humanitarian law. This follows recent resolutions by the International Committee of the Red Cross (ICRC) and its affiliated Red Cross and Red Crescent Societies, as well as the Royal Norwegian Government’s recent announcement that in 2013 it will host a major conference to examine in detail the humanitarian consequences of using nuclear weapons. The concept was first officially recog­nised by NPT members in the 2010 final document as an opportunity to address the disarmament and non-proliferation debate from a new perspective. According to analysts, this conference will allow for a two-pronged examina­tion on the legal nature of nuclear weapons; firstly from the perspective of humanitarian law as the law of armed conflict, and secondly from the perspective of interna­tional human rights law, which is increasingly being used as a complementarity to humanitarian law in ar­eas affected by conflict. Many states expressed their deep concern at the catastrophic humanitarian consequences of any use of nuclear weap­ons, and highlighted that in case of use, such consequences would be unavoidable and emergency relief could not be provided to affected areas. The Vienna Prepcom was the first of three sessions to be held prior to the 2015 Review Conference. The NPT, which entered into force in 1970 and was extended indefinitely in 1995, requires that review conferences be held every five years. 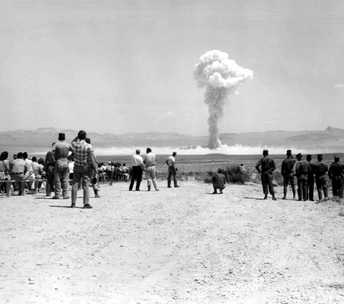 The Treaty is regarded as the cornerstone of the global nuclear non-proliferation regime. It was designed to prevent the spread of nuclear weapons and weapons technology, to further the goal of nuclear disarmament and to promote co-operation in the peaceful uses of nuclear energy.